I am excited to announce that next week I will be teaching my first jewellery class at An Cnoc in Crieff! I'm looking forward to it! 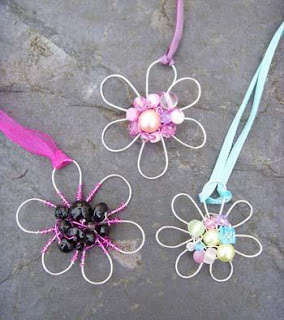 The workshop is how to make wire daisy jewellery (same as the class I taught at Resonate recently, scroll down for more "wire daisy" pictures) - You will learn how to create flower designs with wire and beads, wonderfully versatile, this design can be made into a pendant, brooch, bracelet... imagination is the only limit! You will leave with a lovely piece of jewellery to take home with you. This workshop takes place at An Cnoc, Thursday October 4th, 1.30pm till 4pm, cost £20, all tools and materials are provided. To book and to find out more Phone An Cnoc on 01764 650045.